A wonderful read, thouht provoking. Loved the spare prose, the emotioal tightness this creates. This was a lovestory so poignant and real, a story of several kinds of love, and of forgiveness. Simple language, simple story, yet touching and ultimately sad. Showing that people need to mind their own business and let people be happy. The feeling of hopefulness and having the opportunity to still be happy and in love even in the older ages. It has changed my view on the lives of older people. That they’re just old, boring and stuck in a repetitive and stagnant kind of life. Each person always has a chance to be happy again. No matter when it does happen in your life. My first Haruf and it was very good. 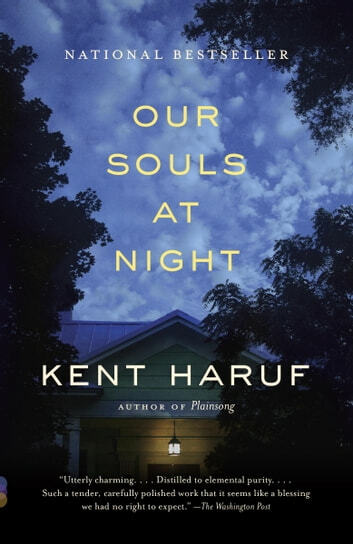 I had some difficulty with Haruf's run-on sentences, but overall I liked the writing and the story. The ending was sadder than I expected and I was left wondering if the boy was going to be okay.